After a beautiful warm day that melted all the snow outside, I got really motivated to get planting! I’m in the Green group, and I can plant peas outside next week. So, I made my plan, wrote my list, and went shopping! I’m up to my ears in seeds and compost, and soon will be ready to head outside. I’m planning on doing some “inter-cropping” by planting quick growing veggies where my tomatoes will grow. Radishes harvest in as few as 25 days, and beets take only 8 weeks. Since my beets will be planted 5 weeks before the tomatoes, they only have to share space for 3 weeks. The other exciting innovation–I am planning to build a trellis out of cattle fencing. It will go up and over my 4×8 bed, lengthwise. By growing cucumbers and squash over the trellis, I hope to provide shade for cool-weather veggies like lettuce. We’ll see if it works! I’m trying two new veggies this year–eggplant and kale. I think it’s fun to experiment with at least one new vegetable every season. My peas have endured snow, and lived to bear many pods! I am also in the green group and I’m having a hard time believing that the right time to plant peas is mid March! You’ve been doing this for years, so I trust you (this will be my first sfg) but it’s common to get snow yet. Then what happens? Can you cover them, use walls of water, or just dig them out? What about if we have consistent below freezing temps? I just want to be prepared ahead of time! Thanks so much for this site! To get feedback, go here and follow the instructions! I have had a somewhat successful garden (with overproducing tomatos and zuchini) in the past but this year hope to really do it right. I have a plan – wondering how to get feedback on what Ive put together… I spent all afternoon poring over the companion planting guide and what I want to plant, and would love to know if I “have it right” or if I am totally off base! 🙂 Can you interplant onions within beds of things that grow taller- such as peas? or even tomatoes? thanks again for your awesome site. Lisa–Sorry about that, it was wrong on the plant spacing page. I updated it–really you can plant 8 cukes per square. And some say you can plant broccoli closer together, but mine get too crowded when I do that. So, do broccoli really need that much space? Also, you put down that you are planting 8 cucumber seeds per square and in the planting guide it says 2. Will you be thinning them out? This looks great. Thanks for sharing. This is my first year and my boxes are built and my soil has been purchased. Now I am planning and will soon put it all together. Thank you for a wonderful and informative site. This is my 2nd year at gardening. I’m surprised and delighted that we are both green group and plan to have many of the same kinds of vegies growing this year. I too am planning to grow fast and slow together. Last year I planted 4 tomato plants on trellis’. Our trellis is made up of 4 metal fence posts approximately 2 squares apart stretching across the 4 foot bed. Each has metal fencing on them about 6 feet tall. Then I clip the plants to the fencing. Last year they grew up and over creating an arch. It was marvelous! We plan to do the same for cukes this year. Your garden is so big, how many in your family? Bye the way, your marinara sauce is great. Thanks so much for all your help and advice. Happy Gardening! Go here to sign up for the newsletter: /newsletter-signup/. To subscribe to receive posts via email, there is a signup on the right hand side bar of my home page. Thank you very much for guiding me. Should I transplant them before true leaves come out? The seedlings are very delicate. Is there a way to not break them. If you have too many seedlings all growing close together, you can transplant them into separate pots. It would be a little extra cost and time, but it might be worth it. I don’t think I would plant tomatoes and carrots together–carrots take a little longer to harvest and go deeper than beets or radishes. If you planted them around the edges, farther away, you could probably make it work. To know what to plant, sign up for my newsletter. It sends a list every week of what to start inside, transplant, or plant outside. If you want to see the whole season at once, the best option is to buy the e-book (see link on left sidebar). I think that you might want to consider planting the tomatoes 1 per box (i.e., spread them among your other veggies). That way when one of them gets a disease, the others won’t all share instantantly. It also means that they each get more chance for ventilation, which is a Good Thing, according to Laurel, of Laurel’s Tomatoes, who should know. (She says “Nope. Never plant more than one in any 3 x 3 or 4 x 4 square box. Plant other stuff around them, sure…but only one tomato per box.” (That’s not an exact quote, but it’s the gist). I live in Northern California and new to gardening. I stumbled on your blog after watching youtube video. I am half way done with planters and getting them ready to plant. After reading your blog I started planning. I did mistake by emptying whole packets of seeds into indoor planter and now i have a lot of seedlings of tomatoes (beefsteak, cucumbers (straight eights), cilantro, Anaheim Peppers). Do you recommend planting carrots in same square as Tomatoes? I noticed that you have planted radish and beets in tomatoes square. if they can be planted in same square, how would you organize them. What other vegetables can be grown in March? My goal is to grow onions, garlic, potatoes, Peas, spinach and Basil. Thank you very much in advance. Thank you for your quick response and information. Actually, you plant 2 or 3 seeds in each hole, then thin it to one plant. Peas are planted 3″ apart–in a square foot garden you plant them in two rows of four on either side of a trellis. Here is the plant spacing, and the article about peas. Great website – very informational! I am fairly new to gardening, so I am sorry if my question is stupid. In the areas where you have planted multiple seeds (example – Peas 8 seeds) do you thin the plants? If so, do you thin to just one plant? Thank you in advance for any information you can provide. I’ve tried Excell, but can’t seem to format it correctly. Hmmm. I just live north of you in Kaysville. I’ve tried square foot gardening for 2 years. I have a slightly modified soil content because we couldn’t afford the true SFG formula (we had to add dirt/soil). Thanks for the ideas on how to plan my garden on the computer. My newsletter goes out on specific dates, so the day of the week changes. It used to be Wednesdays, but due to leap year, it’s going out on Thursdays. Coming soon! This post has a garden planner listed at the bottom that is free for 30 days. I have always used Excel, and that just makes it a matter of formatting, using lines and colors. 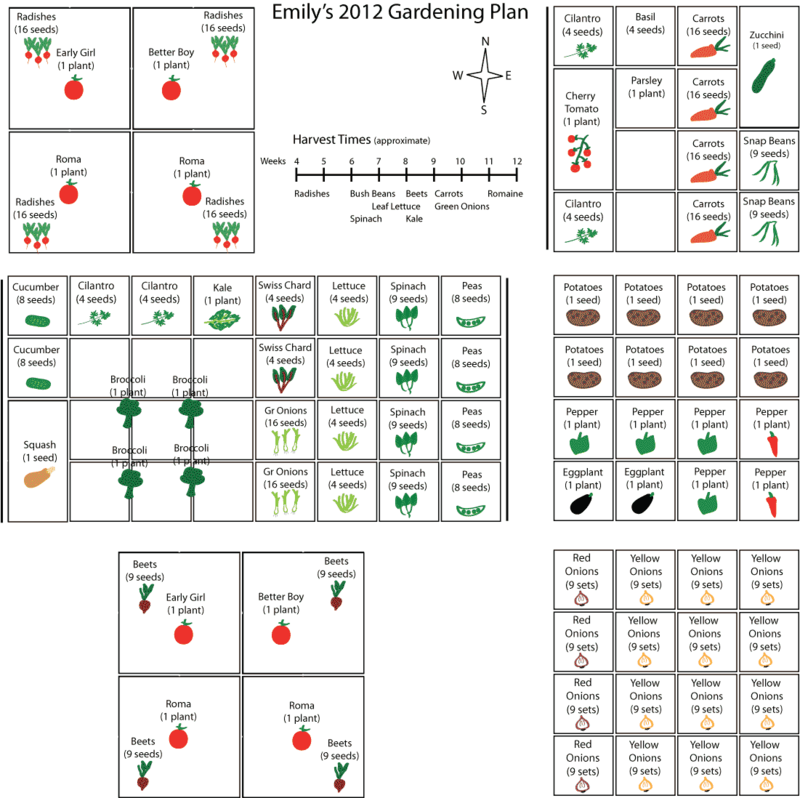 This year I designed my plan in Adobe Illustrator–I’ve been creating my own graphics to use on my site. So mine is particularly fancy this year, and not very user friendly. Hi. I just signed up for your newsletter. I am in the Orange group. We are getting a late start in the planning and anxious to start any seeds that need to go in the dirt this weekend. Can you tell me what day of the week I should receive my weekly newsletter e-mail (not the e-course)? I am trying to get my plan together by Sat. and have found your website to be invaluable! Thanks so much. I would like to plan my garden for 2012. I do it every year, but can’t figure out how to make it look like yours or anyone elses for that matter. So, I end up handwritting it. Yuck. Any suggestions of what program to use and hints on how to use it? Becky–I have peach trees, and so far that is it. I planted them 3 years ago, and last year we got 12 peaches from 2 trees. Before that I purposely didn’t let the peaches grow, so the energy would go into growing the tree. I am hoping this year to get a lot! If I had all the space in the world, I would also add apple trees, pear trees, and maybe cherry trees. You might plant strawberries as a ground cover in flower beds. Then raspberries or blackberries, if you don’t mind the thorns. They tend to grow and spread like a weed, so if I had a large yard and a spot to do it, I would try them. Do you grow any fruit? We just bought a house (yay!) and I really want to start a garden there. I want fruit! But I have to start very small or I will get very overwhelmed. I’ll let you know how it goes!